Sift the flour into a bowl. Make a well in the centre. Whisk together the milk and eggs in a jug. Add the milk mixture to the flour mixture, whisking constantly until smooth. Stir in the butter. Cover with plastic wrap and place in the fridge for 30 minutes to rest. Meanwhile, to make the caramelised apple: melt the butter in a frying pan over medium heat until foaming. Add apple and cook for 2-3 minutes each side or until golden. 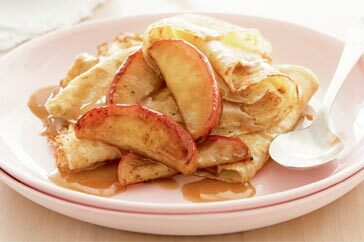 Add sugar and cream and cook, stirring, for 1-2 minutes or until sauce thickens and apple is tender. Heat a crepe pan or 18cm (base measurement) non-stick frying pan over medium heat. Brush with the extra melted butter to lightly grease. Add 2 tablespoons of batter and tilt the pan in a circular motion, swirling the batter to cover the base. Cook for 2-3 minutes or until the edge begins to curl. Turn and cook for a further 1-2 minutes or until golden. Transfer to a plate and cover with a clean tea towel to keep warm. Repeat, in 13 more batches, with melted butter and remaining batter, reheating the pan between batches. Fold crepes into quarters. Divide among serving plates. Top with the caramelised apple. Serve with ice-cream. Tip: Try using 3 medium bananas, peeled and halved, instead of the red apples.